Georgia and I left for Oshkosh early Friday morning and got to Whittman Field about 9AM. Just in time to get our wrist bands and make it over to Forums Plaza for Rod Machado’s 10 o’clock presentation. So, we got to start off the show with a good laugh. After watching Rod, we walked down the main road to look over the manufacturers offerings. Diamond and Cessna both had a lot of airplanes on display. Of the VLJs, I like the Diamond D-Jet the best. I will never own one but, it is a nice looking airplane. The DA-20 with Garmin glass is something that I could fly one day. The HK36 motor glider is also back after several years out of the U.S. market. I wouldn’t mind flying that too. Cessna’s big announcement was that the Skycatcher has completed ASTM compliance clearing the way for deliveries to begin later this year. Of the Cessna models on display, my favorite was the 400 Corvalis TT. 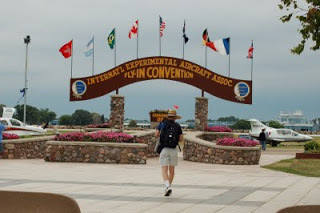 We got some lunch and then worked our way toward the flight line for the afternoon airshow. Along the way, we got a look at the Airbus A380 and the White Knight 2 in Aeroshell Square. More about them soon. We set up our chairs by runway 18/36 in time for the afternoon showcase which proceeded the airshow. The action kicked off with a demo flight by the White Knight 2. The airplane looks ungainly on the ground but is very graceful in the air. 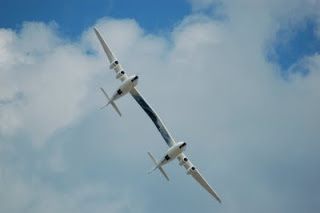 Scaled Composites designed this as a multi-purpose machine. In addition to being a launch vehicle for SpaceShipTwo, the White Knight is also a space ship trainer, transporter and zero G trainer for space tourists. 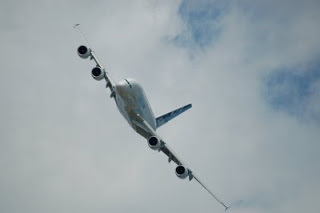 Next was the departure of the A380. This is one huge airplane! It is, however, surprisingly quite. As it came by in a low speed pass, it just seemed to hang in the sky. It is very impressive to see it close up in flight. After the Airbus left, two other very big aircraft arrived. First was the C-17 Globemaster, the Air Forces very large transport. As big as this airplane is, it was able to land on the first half of runway 36. Even more impressive was that the next airplane to arrive, the C-5 Galaxy did the same thing. This C-5 is one of only three of the new, re-engined, M models designated the Super Galaxy. The days airshow was an all female performer show kicked off by the Misty Blues skydive team. 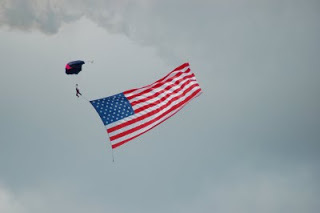 Also performing were Julie Clark – T-34, Susan Dacy – Stearman, Debbie Gary – Marchetti, Jill Long – Pitts, Jess Panzer – Pitts, Melissa Pemberton – Edge, Debby Rihn-Harvey – CAP, Teresa Stokes – Wing walking act, Patty Wagstaff – Extra, Amanda Franklin – Wing walking. The action was fast and all the ladies did a great job. The show concluded with the warbird extravaganza complete with pyrotechnics. After the show, we left to go check in at our hotel. We were staying in Fond Du Lac this first night and so had a half hour drive – not counting the time it took to get out of the parking area.